one // the hubby had some testing done at the hospital, so me and Lil Man decided to go to the mall and ride on the carousel. We both had a lot of fun, and it was nice to get out and do something that he loves to do. two // mother nature is very cruel. On Tuesday, the polar vortex decided to call a truce and give us a near 50 degree day. Even though it was kinda windy, it was nice to experience the first "heatwave" of the year, especially cause I know it's not going to last. three // on a recent trip to Target, my "no clothes spend month" goal was broken due to some boyfriend sweats... but they were only $5.98... and they are super comfortable. four // I can never say it enough, but Target does have some really good clearance. I picked up two $9.99 picture frames for $2.98 a piece. I am trying to collect black picture frames, to complete a gallery wall when we move (eventually), so I was actually a little psyched. five // one of the perks about sponsoring other blogs, is having the chance to participate in the monthly group giveaways. Personally, I love participating, especially with the bigger name ones, because you get more exposure, and of course, build your following. So, this week, I am participating in not one, but TWO different giveaways! Yeah, cra cra shiznit! 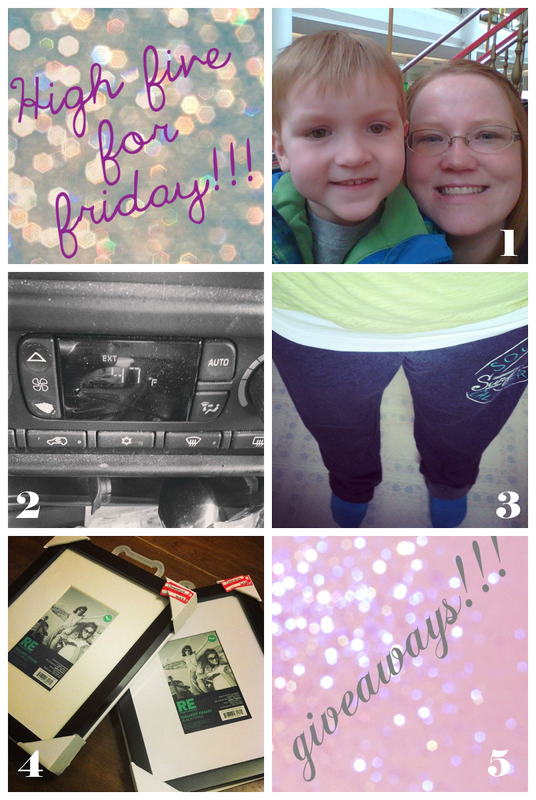 Linking up with: Lauren for H54F, Jennie for Friday Favorites, Whitney for #backthatazzup, Darci, April, Christina & Natasha for 5 on Friday, Allie & Jen for Pit & Peak, and Shane for Weekend Wanderings. I love digging through Target clearance! Every once in a while you find some AWESOME gems! My favorite color -- bright colors. I don't think I have just one.